There are many ways the Uplifting Athletes nationwide network of chapter’s use their platform to inspire the Rare Disease Community. Shining a spotlight on the more than 30 million Americans affected by rare diseases is part of each chapter’s mission. Five years ago, the Penn State Chapter started raising awareness by wearing Uplifting Athletes stickers on their helmets and patches on their Nittany Lions jerseys for their annual Blue-White Game. Over the years, Maryland, Princeton and Stony Brook have each at one time displayed the helmet sticker as part of their spring game to raise awareness. This spring five teams, Penn State, Lehigh, Davidson, Saint Francis and Syracuse, committed to highlighting the rare disease cause by putting an Uplifting Athletes sticker on its helmets at their respective spring games. The challenges faced by the Rare Disease Community are bigger than any one individual, team or organization can tackle alone. Our nationwide network of chapters, run by college football student-athletes, take pride in the opportunity to shine a spotlight on rare diseases. 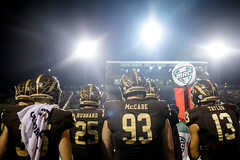 Thank you to the athletic departments at Davidson, Lehigh, Penn State, Saint Francis and Syracuse for supporting their football student-athletes and Uplifting Athletes by allowing their squads to recognize the Rare Disease Community as part of its 2019 spring football game. Uplifting Athletes is pleased to have Lehigh University join the nationwide network of chapters led by college football student-athletes holding Lift For Life events in 2019. The Mountain Hawks will hold their inaugural Lift For Life to support the Rare Disease Community on Tuesday, April 30 at 4:30 p.m. outside the University Center. The event is open to the public. Lift For Life is the signature fundraising event for the Lehigh Chapter of Uplifting Athletes. Lehigh is a part of Uplifting Athletes’ nationwide network of chapters led by college football student-athletes. Each chapter embraces the mission of Uplifting Athletes by using college football as a platform to inspire the Rare Disease Community with hope through the power of sport. The 2019 Lehigh Chapter Lift For Life will be an Offense vs. Defense competition based on the average number of 225-pound bench press repetitions each side of the ball averages. Fans and supporters can choose your favorite side of the ball and make a pledge for the number of bench press repetitions that team averages. So pick one side of the ball and support them by visiting the Lehigh Chapter Lift For Life site. You can also make a flat donation to any team. The proceeds from the Lehigh Chapter 2019 Lift For Life support the mission of Uplifting Athletes and its charitable programs: Rare Disease Awareness, Rare Disease Research, Uplifting Experiences and Uplifting Leaders. Today, the challenges faced by the Rare Disease Community are bigger than any one individual, team or organization can tackle alone. The Lehigh Chapter, along with a nationwide network of teams, is uniquely positioned to educate and engage the local community to shine a spotlight on rare diseases. The Lehigh University football program became part of the nationwide network of chapters led by college football student-athletes last year. The 2018 Touchdown Pledge Drive was the Mountain Hawks’ first event to support the Rare Disease Community. 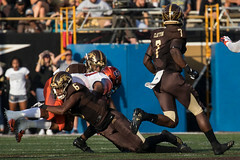 And earlier this year former Lehigh star running back Dom Bragalone participated in the 2019 Uplifting Athletes Reps For Rare Diseases campaign. Please support the Lehigh Chapter and help the 2019 Mountain Hawks reach their impressive $5,000 team Lift For Life goal. The Davidson Chapter of Uplifting Athletes will hold its second annual Lift For Life to support the Rare Disease Community on Thursday, April 25th. Lift For Life is the signature fundraising event for the Davidson Chapter of Uplifting Athletes. Davidson is a part of Uplifting Athletes’ nationwide network of chapters led by college football student-athletes. “In just a year, it’s been incredible to see the development and growth of our Uplifting Athletes chapter at Davidson College,” Davidson Chapter leaders George Hatalowich and Kevin Stipe said. “Our 2018 Lift for Life was a huge success and it was truly a testament to the players, coaches, and athletic department that bought into the organization and chapter’s goals. “We are excited to again use our platform in this year’s Lift for Life to raise money and awareness for the Rare Disease Community. I’m extremely proud to be a part of Davidson’s chapter and I can’t thank the Uplifting Athletes organization enough for their continuous support and guidance throughout this entire process. The 2019 Davidson Chapter Lift For Life will be a competition on the average number of 225-pound bench press competitions among the six fundraising teams. The event is private this year. Fans and supporters can select any one of the six teams and make a pledge for the number of bench press repetitions that team averages. So find your favorite 2019 Davidson player on any of the six Wildcats’ Lift For Life teams and support them by visiting the Davidson Chapter 2019 fundraising site. You can also make a flat donation to any team. The proceeds from our 2019 Lift For Life support the mission of Uplifting Athletes and its charitable programs: Rare Disease Awareness, Rare Disease Research, Uplifting Experiences and Uplifting Leaders. Today, the challenges faced by the Rare Disease Community are bigger than any one individual, team or organization can tackle alone. The Davidson Chapter, along with a nationwide network of teams, is uniquely positioned to educate and engage the local community to shine a spotlight on rare diseases. Uplifting Athletes was pleased to have Davidson College join the nationwide network of chapters led by college football student-athletes in 2018. The Davidson Chapter showed the character of their football program in its first year supporting the Rare Disease Community and earned the Best Newcomer Award for 2018. Please support the Davidson Chapter and help the 2019 Wildcats reach their impressive $15,000 team Lift For Life goal. The Saint Francis Chapter of Uplifting Athletes will hold its annual Lift For Life to support the Rare Disease Community on Sunday, April 7th. Lift For Life is the signature fundraising event for the Saint Francis Chapter of Uplifting Athletes. Saint Francis is a part of Uplifting Athletes’ nationwide network of chapters led by college football student-athletes. The 2019 Saint Francis Chapter Lift For Life will feature a 225-pound bench press competition between the 2019 Red Flash offense and defense. The event is open to the public and will start at 12:30 p.m. at DeGol Field. Fans and supporters can select to support either the offense or defense and pledge for the average number of bench press repetitions they put up. So choose one side of the ball and back that team by visiting Saint Francis Chapter Lift For Life page and pledging now! You can also make a flat donation to either team. The proceeds from the Saint Francis Chapter 2019 Lift For Life support the mission of Uplifting Athletes and its charitable programs: Rare Disease Awareness, Rare Disease Research, Uplifting Experiences and Uplifting Leaders. Today, the challenges faced by the Rare Disease Community are bigger than any one individual, team or organization can tackle alone. The Saint Francis Chapter, along with a nationwide network of teams, is uniquely positioned to educate and engage the local community to shine a spotlight on rare diseases. The Saint Francis Chapter started tackling rare diseases in 2012 when it joined Uplifting Athletes. The student-athlete led Saint Francis Chapter serves the rare disease community in honor of the younger brother of former Red Flash wide receiver Jeff Wasilewski. Please support the Saint Francis Chapter and help the 2019 Red Flash reach their impressive $4,000 team Lift For Life goal. 2019 Young Investigator Draft grant recipients (left to right): Dr. Alberto Japp, Dr. Eugene Hwang, Dr. Shana McCormack, Dr. Elizabeth Harrington, Dr. Brian Sworder and Dr. Brenda Gallie. Lincoln Financial Field in Philadelphia experienced a Rare Disease Community takeover Saturday night when Uplifting Athletes hosted its 2nd Young Investigator Draft presented by CSL Behring. Several of the grant recipients said the process of being drafted was a “first” for them and despite being briefed and told how the evening would unfold they said there were no words that fully prepared them for the energy and excitement the evening created. The drafted grant recipients were chosen by this year’s priority partners: Accelerate Brain Cancer Cure, Castleman Disease Collaborative Network, Friedreich’s Ataxia Research Alliance, Leukemia Lymphoma Society and Project ALS. Each priority partner had a guest presenter make the selection. The 2019 list of guest presenters included Kyle Bryant, BethAnn Telford, Dr. David Fajgenbaum, Malik Turner and Adam Breneman. After draft emcee Stephanie Stahl, a health reporter for media sponsor CBS 3 of Philadelphia, closed the draft it was time for a couple special presentations. Dr. Brenda Gallie of Children’s Hospital in Toronto received the Uplifting Athletes Young Investigator Draft Collaborative Leadership Award for her decades of commitment to eradicating the rare eye disease retinoblastoma. She was introduced via video by former USC long snapper and 2016 Uplifting Athletes Rare Disease Champion Award winner Jake Olson, who is legally blind after losing both is eyes to retinoblastoma. To bring down the curtain on the evening, the 11th winner of the Uplifting Athletes Rare Disease Champion Award, University of Kansas football coach Joshua Eargle, took the stage and delivered a moving and inspirational speech. Coach Eargle shared the story of his family and their rare disease journey with their daughter Landrey. For nearly six years the Eargle’s stayed quiet about their struggles with the extremely rare diagnosis for Landry. After sharing their story publicly for the first time in 2019, doors and avenues have opened they never imagined. This has inspired Coach Eargle and his wife Kristen and made them even stronger advocates for the Rare Disease Community. For the fifth consecutive year, Uplifting Athletes is empowering NFL prospects with the opportunity to use their NFL Pro Day as a platform to give back by raising funds and awareness in support of the Rare Disease Community. This year Uplifting Athletes currently has 44 players who chose to participate in Reps For Rare Diseases 2019 as part of their NFL Pro Day workout. The Uplifting Athletes 2019 Reps For Rare Diseases Pro Day Team is comprised from 18 different college football programs. Clayton Thorson, Flynn Nagel, Jake Collins, Blake Hance, Jordan Thompson, Jared McGee and Tommy Doles all hail from Northwestern. Representing NC State are A.J. Cole, Terronne Prescod, Steph Louis and Reggie Gallaspy, Jr. From Penn State its Koa Farmer, Nick Scott, Kyle Vasey and Jake Cooper. And Tyler Newsome, Miles Boykin, Julian Love, Sam Mustipher, Nic Weishar and Justin Yoon from Notre Dame. The quartet from Princeton includes John Lovett, Cody Smith, Steve Carlson and Charlie Volker. Maryland has Brendan Moore and Ty Johnson. Representing Georgia Tech are Kyle Cerge-Henderson and Andrew Marshall, while Eric Dungey and Kielan Whitner come from Syracuse. Alec Eberle and Derrick Kelly II come out of Florida State and Antonio Jackson and Lawrence Menyah played for Fordham. Other schools representatives include: Nick Allegretti from Illinois, Clemson’s Milan Richard, Chris Myarick of Temple, Jon Reschke from Michigan State, Nick Giorgio of Springfield, Kansas’ Mavin Saunders, Jamauri Bogan of Western Michigan and Craig Reynolds from Kutztown. Fans and supporters can become teammates of any one of our NFL Pro Day participants this year and help Uplifting Athletes Tackle Rare Diseases by simply making a pledge for every bench press repetition or each vertical/broad jump inch the player achieves. The first Reps For Rare Diseases campaign was run by former Penn State and current Detroit Lions tight end Jesse James.